It’s Week 3 people! Time is a-flying as we reach the half way point of our rehearsal process. Even without TFL on our side, everybody gathered together in super high spirits. Why? Because we’re all super nice, fun people that’s why! 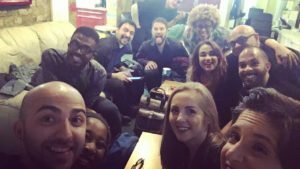 It was a particularly exciting and busy one this week with six jam-packed days of Act Two action, and it (obviously) didn’t go without its fair share of giggles along the way! We had a full day of choreography on Monday to kick start proceedings which was not dissimilar to a week’s worth of ‘Insanity’ work out videos – looking great though team so it was all well worth it for sure. We were also visited this week by ‘Team New Wolsey Theatre’ (Sarah, Jeni, Giles, Pete & Lorna) where a whole bunch of company interviews took place (nobody was trying to ‘video-bomb’ any of those…honest!). Although they did arrive with some rather incriminating footage of me spectacularly falling on my face last week… Pete, I shall ply you with Monster Munch for a month if you keep that badger under wraps! 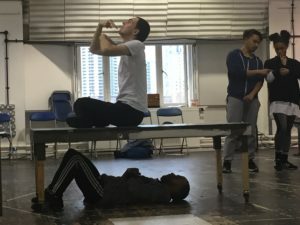 However, the incredible news of the week came in the beautiful form of an Olivier Award nomination for the first Ramps on the Moon project from last year The Government Inspector produced by the wonderful Birmingham Rep. It also featured a couple of our Tommy Team; the fantastic Becky (Newspaper Vendor) and Daryl (one half of our BSL magic) – huge congratulations to all involved. #GovernmentInspector for Outstanding Achievement in an Affiliate Theatre Olivier 2017… spread the word! With this information delivered to us we were in high spirits as the creative team put us through our paces, but not without our share of funnies to fuel us through! Tuesday found us back in our circle of chairs ready to read the second act of the show. This was where Kerry (Director) asked Becky: “What did you do last night?” And she innocently replied “Do you really want to know? !” Intriguing as that sounded, it turned out that she was reading her script like a true pro. This was also the first time that the brass section had a practice session with the core band which sounded nothing short of awesome and was incredible fun. It also involved Becky with her alto sax (wow, she’s popular in here this week!) announcing that “I’m going to skip a few low notes until I figure out how to play them…I never go that end!” and Stacey on trumpet playing the ‘Acid Queen’ in a random key, creating the ‘atonal’ version and giggling her way through it! In food related news, Hearns (Dancer) took 15 minutes of our lunch ‘HOUR’ hogging the sole microwave to heat his frozen lasagne. Needless to say, when he approached the kitchen the following day with his bolognese he was shunned to the back of the queue after being comically berated by Patricia (Company Manager) and Donna (Mrs Walker) respectively! Soz Hearns! Maybe stick to naked chicken and salad next week eh?! 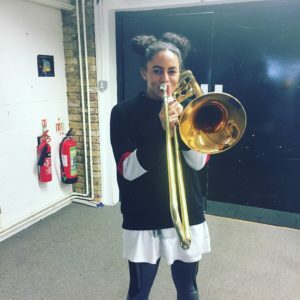 Cast member Natasha Julien on the trombone, giving Natasha Lewis a run for her money! Friday began with Alim (The Lover) kindly buying the rehearsal space security guards breakfast muffins, and my favourite Kerry quote to date was coined: “You’re all like a sweet dessert – apple strudel to be exact” (but it did make me hungry. If only I hadn’t scoffed all of those cookies on Monday). The tube situation was particularly dire on Friday evening resulting in Steve (Bass) HAVING to stick around and have a curry while Patricia wound up sitting down to dinner with the owner of the kebab house she was in for some nosh and a cheeky dram of firewater!! We also discovered that uber talented Max (Mr Walker) has been creating ‘one night tunes’ every evening and they can be found at www.soundcloud.com/max-runham where does he find the energy, fab lad! While Amelia (The Assistant) performed some of her own material at the Women of the World festival at the Southbank Centre, to a packed house. All of those creative souls – it’s amazing! 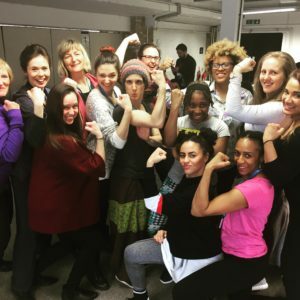 The ladies of the Tommy cast pose for International Women’s Day. Saturday saw us enjoying Alim’s glee at his new yoga mat for warm up (which seemed to be covered in his belly button fluff!) 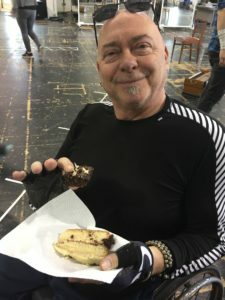 and amidst all of the excitement of that we still found time to sing a ‘tuneful’ Happy Birthday to our gorgeous Garry (Uncle Ernie) who turned 21 again on Sunday… oh how I love a birthday! I hope he enjoyed his celebrations at the Arsenal v Lincoln match to mark the occasion! Company statement of the week occurred today and goes to Lukus who boldly admitted: “Sorry Kerry, can you repeat that, I wasn’t listening because I was too busy watching the interpreter!” At least he’s honest!